Deadmau5 Mix is an iPhone app that lets you mix tracks from Deadmau5 on your iPhone. There are lots of DJ apps coming out for the iPhone and iPad and most of them have basically the same features just presented in a different style. 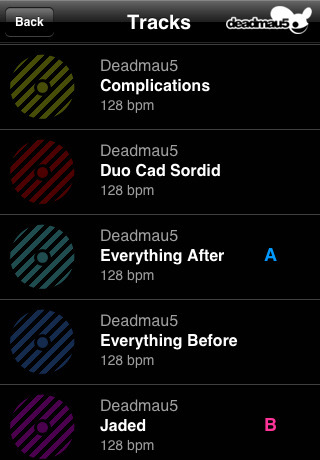 What’s nice about the Deadmau5 app is that it does the beatmatching automatically, and it works to perfection. There is really not a lot of skill required to use the app, but you do get that perfect matching beat mix that makes you feel like a pro DJ at times. The one and only issue with the app, is its lack of support for external music, and this app only has 10 drum tracks which basically all have the same BPM. User interface is pretty self explanatory. You have 2 tracks, A and B and you can load in 1 of 10 available Deadmau5 tracks. You can touch and drag the playing tracks on the screen to pseudo scratch, pause and play. The track gets auto-synced as soon as you load it in and press play. There are a few standard effects you can enable using simple buttons per track, including loop, tilt, hi filter, lo filter, delay, and flanger. You have access to a corssfader on the bottom and the volume per track is adjustable. Overall, the beatmatching tech here is brilliant, and mixing DM5 on your iPhone is pretty fun. 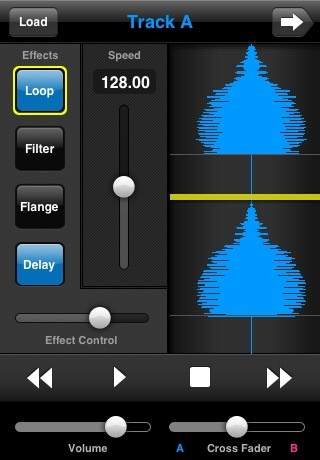 What this app lacks is tracks with other instruments like synths and vocals. There is no way to record your mixes, and you can’t bring in your iPod music, which limit the apps potential. There is another version of this app called Deadmau5 Mix II (iTunes $2.99) which has tracks from the new Deadmau5 album “For Lack Of A Better Name” which comes with a wider set of instruments. AppSafari review of Deadmau5 Mix was written by Joe Seifi on February 15th, 2011 and categorized under App Store, Fun, Music. Page viewed 4061 times, 4 so far today. Need help on using these apps? Please read the Help Page.